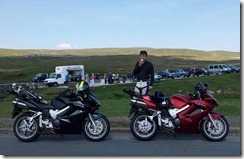 Yesterday we went out on the VFRs for a run into County Durham and back via Tan Hill. We filled up at our local garage and then headed over to Clitheroe as usual. 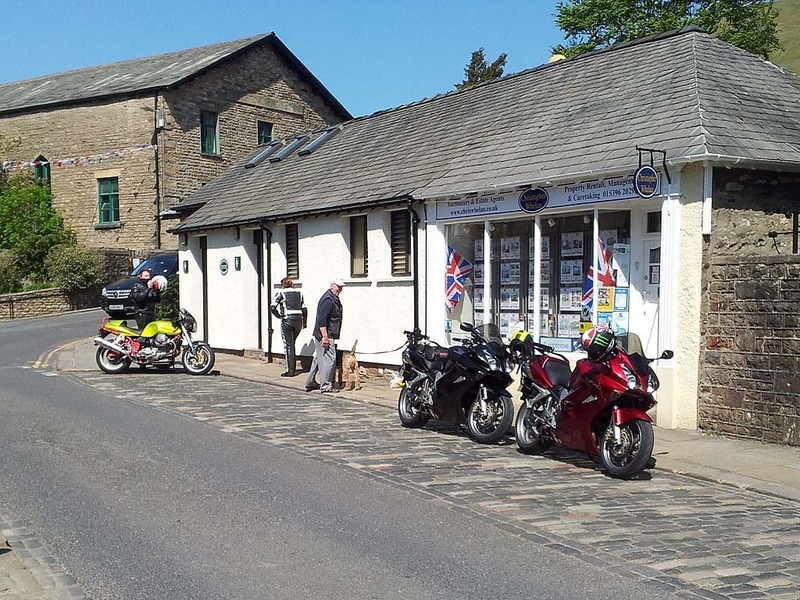 For a change we headed to Devil’s Bridge via the B6478 through Slaidburn and then through Gisburn Forest and past Stocks Reservoir. This brings us out on the A65 a couple of miles outside Ingleton. 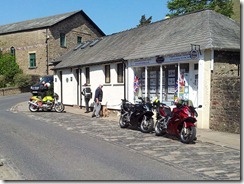 We passed through Ingleton and soon arrived at Devil’s Bridge but decided not to stop because it was so busy. 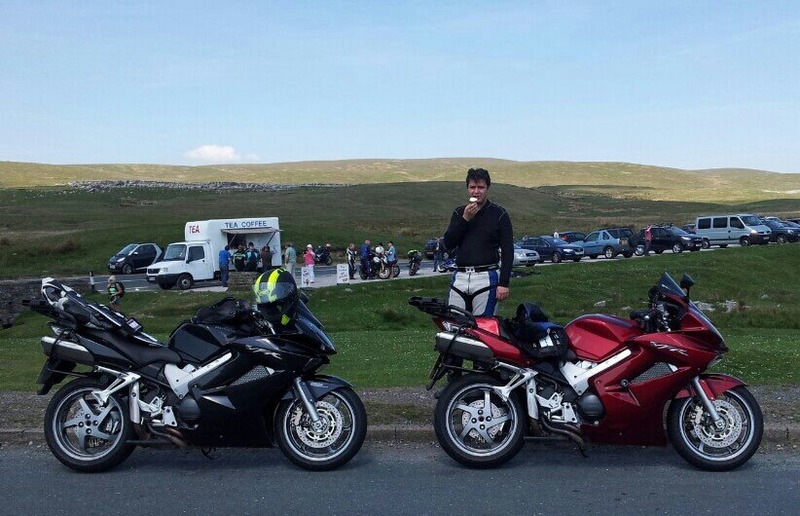 We joined the A683 and headed over to Sedbergh, where we stopped for a quick comfort break. We then continued on the A683 all the way to the A685 which we then followed into Kirkby Stephen. We passed through Kirkby Stephen and headed on the A685 to Brough, where we joined the B6276. We followed the B6276 passed Selset and Grassholme Reservoirs and all the way into Middleton-in-Teesdale. We stopped at Cafe 1618 again for lunch as we were very impressed with our last visit a few weeks ago. We left Middleton-in-Teesdale on the B6277 and headed over to Barnard Castle. We didn’t stop as we had only just had lunch so continued passed on the B6277. We crossed over the A66 onto Stang Lane and headed over to Arkengarthdale. We then turned right onto the Long Causeway and followed that all the way to Tan Hill Inn. Here we turned onto minor roads and headed South to Keld. Just before joining the B6270 at Keld you go down some very tight hairpins, which Helen really doesn’t like. As usual she managed to meet someone coming up as she was going down. We passed through Keld and then joined the road that takes you over Buttertubs Pass and down into Hawes. We passed through Hawes which was very busy and then joined the B6255 and headed over to Ribblehead Viaduct. We stopped at the viaduct for a much needed ice-cream. Just as we were about to leave Camsdad and Mickster from NUKB turned up. After a brief chat we left and headed our separate ways. We joined the B6479 and headed through Horton-in-Ribblesdale and onto Settle. We stopped in Settle briefly to fill up as we were both on one bar on our fuel gauges, we only put £10 in due to the price. We left Settle and headed back to Clitheroe via Wigglesworth and Sawley and then turned left and went over Pendle Hill and down into Sabden. We then continued on to Simonstone and then followed the A56/M66 home.